In the age of electronic watches, why a watch winder as a gift? Well, watch winder may be a slight misnomer, unless you really understand how the most modern of watches work. Watches that do not require manual winding OR a battery are powered by the movement of the arm while walking and are oftentimes referred to as automatic watches. A watch winder simulates the walking movement by rotating in circular patterns. This keeps the watch “wound” when not being worn and ensures accurate time, especially for watches that keep perpetual calendars or moon phases. So how do those watches work? In a nutshell, there’s a weighted pendulum that swings and transfers energy to wind a mainspring. Early moderns only moved 180 degrees so would only wind when the arm swung in a single direction. As these movements were limited by restraints, they were referred to as “bumper” designs and would keep time for ~12 hours after movement stopped. As these evolved, Rolex designed a pendulum that would swing the full 360 degrees while simultaneously increasing the amount of energy stored; these would keep time up to 35 hours. The final evolution was the introduction of ball bearings which increased the weight of the moving winder, significantly increasing efficiency, and remains the standard today. Wondering when these innovations occurred? Well, the first automatic watch was developed in the 1770s in France, and the final ball bearing solution was developed in 1948. Automatic watches remain the mark of a high-end, luxury watch, though, ironically, because of the size and weight needed to keep wind the mainspring, many luxury watch makers continue to build manual wound watches, which is the simplest design. So as you look at someone who keeps and enjoys luxury watches, it’s likely that at least one is an automatic watch. Need to think of a gift for him or her? Try a watch winder. 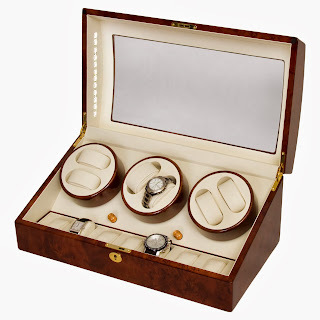 You can visit ChasingTreasure.com where we have many examples of the most modern and elegant watch winders.